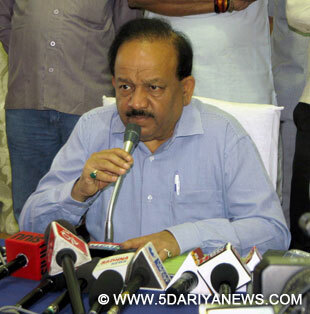 Health Minister Harsh Vardhan Monday said that India aims to eliminate dreaded vector-borne disease kala-azar by 2015. "We are confident to eliminate kala-azar by 2015 with a new road map," Harsh Vardhan said at a function here after launching non-invasive diagnostic methods for detecting kala-azar by using oral fluid and urine samples at Rajendra Memorial Research Institute of Medical Sciences here.Harsh Vardhan also attended a day-long meeting on kala-azar with officials and experts from Bihar, Uttar Pradesh, West Bengal and Jharkhand. "He deliberated on kala-azar with officials of four states, where it has turned endemic," an official of state health department Anand Kishore said.Bihar Chief Minister Jitan Ram Manjhi also said that his government is ready to work to eliminate kala-azar by 2015. "We have taken it as a challenge to make Bihar free from kala-azar," he said. "We will support and help the central government's measures to eliminate kala-azar in the state," Manjhi said adding that 70 percent of kala-azar patients in the country are in Bihar.Kala-azar is globally known as visceral leishmaniasis. Its carrier is the sand fly found in the eastern UP, Bihar, Jharkhand and West Bengal. The disease usually strikes during the monsoon months. It is the second deadliest vector-borne disease after malaria. Presently, its incidence is concentrated to about 54 districts, with Bihar being the worst affected. Ninety percent of visceral leishmaniasis cases in the world occur in 5 countries: Bangladesh, India, Nepal, Sudan and Brazil.